Welcome, we are very pleased that you've purchased one of our themes. With this document you will get general information about Salmon theme, hope that will be helpful for you. Import of the demo content failed or nothing happened, what should I do? If not, please contact your hosting/server provider to upgrade. If this still didn't resolve the import issue, please try to check the following file on https://github.com/proteusthemes/one-click-demo-import/blob/master/docs/import-problems.md and try to find another import issues. If nothing of above didn't help, contact the theme support. How do I change or translate the text of the reservation or contact form? The text of the reservation and contact form you can change or translate through the "FORQY Restaurant" plugin translations. Contact or reservation form doesn't send emails, what should I do? Probably you have a problem with configuration of the PHP mail() (intended for sending emails) function on your server/hosting - as thousands of WordPress users. Therefore you will need to make some additional changes on your server or sending emails through the SMTP (Simple Mail Transfer Protocol). You can try to set the SMTP server using the WP Mail SMTP plugin. How do I rearrange a menu sections or categories? Menu sections or any categories you can rearrange using the plugin "WP Term Order". You can install this plugin on "Appearance > Install Plugins" page or manually from WordPress Plugins. Then you can rearrange categories using drag-and-drop. If you plan to make some modifications to the code of the theme, will be better to make them via the child theme. If you make modifications directly to the parent theme, you will lose them when the theme is updated. When you make modifications inside of the child theme instead, you can update the parent theme without losing any change you have made. Child Theme you'll find in a "salmon-child.zip", which is included in a main downloaded package. More information about child themes you can find in WordPress Codex - https://codex.wordpress.org/Child_Themes. To install this theme, you must have a working version of WordPress already installed. For information regarding installing the WordPress platform, please see the WordPress Codex - https://codex.wordpress.org/Installing_WordPress. Use your FTP Client to upload non-zipped folder called "salmon" (is located inside of downloaded zip package) and "salmon-child" (optional child theme) into the "/wp-content/themes/" folder on your server. Go to "Appearance › Themes › Add New › Upload Theme"
To add the needed functionality to the theme is necessary to activate the required plugins. Go to "Appearance › Install Plugins"
The functionality is added to the WordPress, and you can use the theme in a standard way. Go to "Appearance › Import Demo"
Let the importer work until it displays information about successful (or unsuccessful) importing. Please be patient, it may take a few minutes. The demo content, widgets and theme options should be imported and you can check your site. Switch to manual import by click to link Switch to manual import! on the right side. Upload import files that you can find in a downloaded package in a "content/DEMO" folder. Go to "Settings › Permalinks"
Select your option of permalink structure in "Common Settings"
On every change of the slugs always go to Settings › Permalinks page and resave. By default, the homepage will use a standard blog layout. If you wish to use this layout, you don't need to follow any additional steps. Create a new page by going to "Pages › Add New"
Fill in the "Title" of the page (for example: "Homepage") and don't add content, leave it blank. Any content here will be ignored. Go to "Settings › Reading"
Check the radio button "A static page (select below)"
Homepage is now set correctly. Don't be alarmed that the page is blank for now, now you need to create slides into a slideshow by following the instructions below. Create a new slide by going to "Slideshow › Add New Slide"
To enable the button, fill the "Button" text and "URL" you wish to link to like "/the-page" or "https://www.domain.com/the-page". The first slide is now created. Repeat this process until you'll have created all the slides. Fill in the "Slideshow Badge Text", default: "Book a table online"
The badge should appear on the homepage. The first "Call to Action" block is now created. Repeat this process until you'll have created all the blocks. The about section should appear on the homepage. Fill in the "Title" of the page (for example: "Blog") and don't add content, leave it blank. Any content here will be ignored. Blog page is now set correctly. This theme supports 4 of the standard WordPress post formats. Post formats are a way for you to choose a specific "format" for each post. Basically, once you give a post a format, it will change how that post is displayed on the front end of the site. For example, a "quote" post will output your entire post content as a blockquote. You can choose a post format from the "Format" box on the "Add New Post" page. Create a new post by going to "Posts › Add New"
The first post is now created. Menu page is now set correctly. Create a new menu by going to "Menu › Sections"
Find the section "Add New Section"
The first menu section is now created. Repeat this process to create more sections. Now you must to add the menu items into sections, see below. Create a new menu item by going to "Menus › Add New Menu Item"
The first menu item is now created. Repeat this process to create more items. Events page is now set correctly. Create a new event by going to "Events › Categories"
Find the section "Add New Category"
The event category is now created. Create a new event by going to "Events › Add New Event"
The first event is now created. Gallery page is now set correctly. Create a new gallery category by going to "Gallery › Categories"
The category is now created. Create a new gallery by going to "Gallery › Add New Gallery"
The first gallery is now created. Reservation page is now set correctly. Reservations are saved to admin, if the reservation form was sent. Reservations you can manage in Reservations section. Reservations never won't be displayed on frontend. To protect form from spam, please install supported "WordPress reCaptcha Integration" plugin. Contact page is now set correctly. The theme has many shortcodes to use in a page, post or widget content. 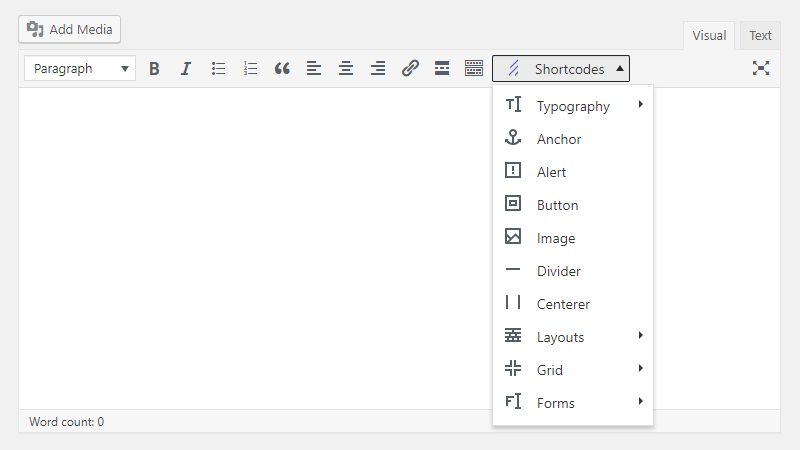 You can quickly add shortcodes through a wizard to a Post/Page Editor by clicking a Shortcodes button. Or copy some shortcode from below. This shortcode performs highlighting of a selected text. This shortcode performs emphasizing of a paragraph. This shortcode performs highlighting of a first letter of the paragraph. This shortcode performs highlighting of some important notice. This shortcode adds an anchor to link to some section from navigation or text link. This shortcode adds an alert. This shortcode adds a button. This shortcode adds an image with lightbox. This shortcode adds a divider. This shortcode adds a centerer - a block that specifies the width of the content. Recommended to use this shortcode on page template "Page - Stretched". This shortcodes adds a predefined multicolumn layouts. Adds a predefined 2 columns layout. Adds a predefined 3 columns layout. Adds a predefined 4 columns layout. Adds a predefined 5 columns layout. This shortcode adds a layout container. Please, don't add content directly into this shortcode, first, add columns for your content. This shortcode adds a layout column. This shortcode requires being inside of a container shortcode. This shortcode adds a contact form. This shortcode adds a reservation form. One of the great new features in WordPress 3.4 is the Theme Customizer which allows you to modify options for a theme and instantly preview them on the site. Go to "Appearance › Menus"
Below you can find a list of the recommended plugins with the theme, which are well tested with the theme. Recommended plugins you can easily install with plugin installer in Appearance › Install Plugins. One Click Demo Import - Import your demo content, widgets and theme settings with one click. Analytics Tracker - Analytics Tracker makes it super easy to add Google Analytics tracking code on your site. MailChimp for WordPress - MailChimp for WordPress, the absolute best. Subscribe your WordPress site visitors to your MailChimp lists, with ease. WP Smush.it - Reduce image file sizes and improve performance using the Smush.it API within WordPress. WP Mail SMTP - Reconfigures the wp_mail() function to use SMTP instead of mail() and creates an options page to manage the settings. WordPress reCaptcha Integration - reCaptcha for login, signup, comment forms, Ninja Forms and WooCommerce + Salmon Contact and Reservation forms. Sort taxonomy terms, your way. WP Term Order allows users to order any visible category, tag, or taxonomy term numerically, providing a customized order for their taxonomies. Loco Translate provides in-browser editing of WordPress translation files. Allows you to regenerate your thumbnails after changing the thumbnail sizes. Autoptimize makes optimizing your site really easy. It concatenates all scripts and styles, minifies and compresses them, adds expires headers, caches them, and moves styles to the page head and can move scripts to the footer. This plugin disables the new WordPress emoji functionality. To edit the Title, Content or Footer of subscription form, please navigate to "Appearance › Customize › Newsletter"
Navigate to "Appearance › Widgets"
Now will be the theme translated to your language. If you have any questions regarding this theme or need support, please contact us through the contact form on the Support Page of the theme. If you need to help with the customizations of our themes, just let us know on our email support@forqy.com and we will create a quote for you.